I know what corners I can cut with diet and sleep and exercise and still function at a very high level, simply because there aren’t many stressors depleting me. I’ll drink coffee every morning, just because I like it. I’ll eat things that aren’t terribly nutritious, just because they taste good. I’ll blob around the house for a day or two, just because I feel lazy. But when stressors appear, I snap out of my slackerdom. so that the stress doesn’t take me down. Now, I live by this philosophy. or when I’m taxed externally or emotionally ~ I can keep the stress from damaging my physical and emotional wellbeing by bringing certain things into heavy rotation and leaving other things out. I stop drinking coffee and switch to Yerba Mate. not for aesthetics, but to keep my lymph system flowing. And I start doing chlorella shots! Chlorella, for me, is what a can of spinach was for Popeye. When I take a shot, I feel it in my brain, in my blood. It’s like diving into water – that rush of purity and invigoration. Chlorella is extremely nutrient dense, packed with amino acids and omegs-3’s. Google will tell you that in much greater detail. It tastes the way the ocean smells at low tide. I’ve tried mixing it with juice or putting it in a smoothie but it just contaminates the whole thing. The only way I can take chlorella is to throw it back like a tequila shot, and then immediately bite into a lime wedge. The lime erases the nasty taste and I am left with the full body ZING! yes, you can buy chlorella in capsule form. and they don’t give me the instant zing. not all chlorella is created equal. and now I’m going to take a shot and go write Part V! The vet recommended it to Rascal (the cat) when he had fatty liver disease. Chlorella plus Sam-e to boost his liver function so he can beat the illness! Sounds like a wonder-powder. How much do you take? I would love to try it but must get the capsules. If it tastes rank I simply will not do it after the first couple of times. And how often? Thanks – love reading both your blogs! As a recovering alcoholic kombucha is definitely OUT for me, but I love kefir and am curious to try the chlorella, thanks! aahhhh… pond scum! i love it! Sounds disgusting, but so do many of the things that I take :). I do beet kavass (which has kefir in it as well) and vitamineral in my protien shakes each day with a littl ACAI thrown in for good measure. The vitamineral is green and dense and gross…but I guess its good for me:) You go, Shreve. Whatever works. That plate/platter in the photo is gorgeous. 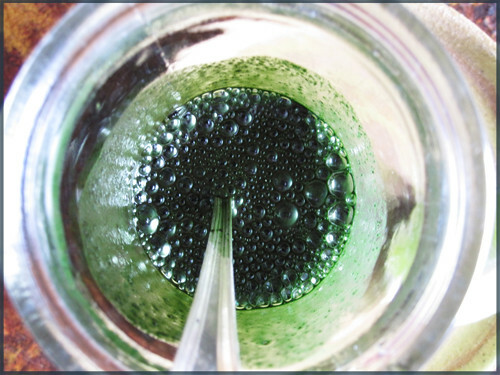 I have been thinking about trying it – my staple right now is Spirulina, I mix in smoothies and green juice and don’t think that it contaminates it….but chlorella is a different strain, maybe even refined differently? I wonder do you think its better? Or a personal preference thing? 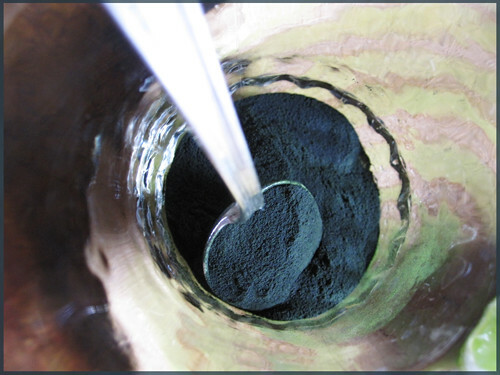 Spirulina give me such a great metal kick in the morning that lasts till the afternoon I just love it! Gonna have to try shooting it like that – sounds like fun! I’ve been wondering about the difference between chlorella and spirulina, too…? Hmm. U ~ once a day is good, twice a day is good too :) if you get the pills/caps, it will have a recc. on the bottle. I do a teaspoon to a tablespoon at a time. A ~ thankyou! my little sis made it for me. i adore it. S & L ~ not sure of the precise differences between spirulina and chlorella ~ both are algae; I’ve always been drawn to chlorella as opposed to spirulina and I just go with that feeling. but other people really dig spirulina. I don’t think there’s a right or wrong answer, it’s more about finding what works for you and ‘fits,’ as long as it’s a quality product and ethically harvested. I had tried the algae several years ago. It was, in a word, nauseating. I had no idea that lime would help take the taste away. You have inspired me to possibly give it another whirl. I love algae. Been taking it for years. Just beautiful pictures. Never seen such beautiful food shots! Need to ponder swallowing something like pond scum, but truly don’t feel up to par at all, so maybe this will help. Way too many losses recently! Thank you! I’m not sure I’d have the guts to drink it – but it is a glorious color! If it hadn’t been for such great questions, I wouldn’t have gone looking. I’ve had such a hard time getting them down, that I’ve looked at the both as just green food. Anyone here tried E3-Live? It’s another one, and now I’ll need to go look up the difference from the other two! I’ll give your way a try and go with the recommended ratio from the above link. I’ve also tried the E3-Live with pineapple juice, even from concentrate, which helps it go down pretty nice. I think I might like the lime and pineapple juice together. 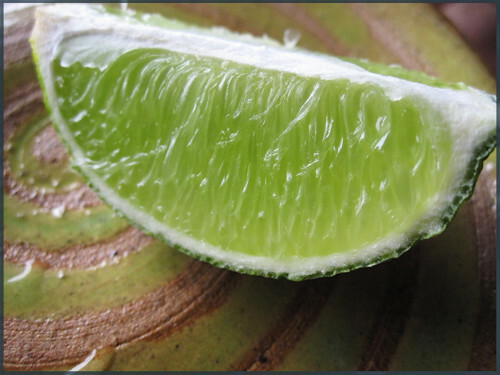 Isn’t lime also decent detoxifier? A friend of mine used to do lime and olive oil before bed just for that purpose. Well I’m intrigued. And I’ll admit I’m swayed by the beautiful pictures (such pretty greens!) even while reading the unappetizing comments – I must give it a try. I’ve been taking fish oil morning and evening for almost two years but the incidences of burping fish oil are turning me off the stuff. I know it’s good for me and it supplements a diet in which I simply cannot eat enough fish to match the capsules. I can see maybe switching from the fish oil to the chlorella capsules provided I don’t burp kelp taste. Everyone needs to find their own balance of supplements because all of our bodies are different, as well as our diets. I’m finding extra vitamin D is helping me. Also probiotics, folic acid and potassium. I’ve just started taking CoQ10. My energy is improving monthly. But I think that’s mostly due to switching from Simvastatin to Lipitor. Everything else is gravy. Can you bake or cook using it without it ‘tainting’? If so, I wonder what nutritional benefits remain. hey mlaiuppa, “nordic naturals” does a fish oil with the co-q10 in it and u dont get an after taste or anything. i take 1 of those per day. my ex was prescribed fake fish oil (yes fake) to control is cholesteral and it took 4 of his pills to equal 2 of my real stuff, so i just cut the dose in half cause its still working great. my doctor even recomends cause she beleives it helps my over all system. SK ~ definitely do not cook it! raw raw. M ~ the omega 3’s / DHA found in fish oil is there because fish eat algae, or they eat fish that eat algae, just as grass-fed, grass-finished beef is full of omega 3’s, because the cows eat only grass (source of omega 3) instead of corn (converts to omega 6, the bad stuff). So, yes you can bypass the fish oil by eating what they eat – the algae. I’ve never had a chlorella burp. I’ve been taking wheatgrass shots chased by a little OJ. I also feel it in my brain and blood. Do you know if these have very similar effects on the mind/body? I would like to find something that didn’t require a juicer. Wheatgrass also tastes digusting but the health benefits outweigh the flavor. I think there’s going to be a lot of new green “poopers” in the world and it won’t be from green eggs and ham, lol. Beautiful shot of Charlie today Shreve. The only time green algae didn’t instigate my gag reflex was when I had it mixed with peach nectar. I can’t explain why or how it worked, but I could *drink* it instead of chugging it. I had that happen with fish oil too. If you put them in the freezer it seems to minimize it a bit. have you tried Naked Juice’s Green machine? It’s pretty tasty and has Chlorella in it- I’ve been chugging them for the past two weeks and loving it! Regarding keeping the body moving, you may enjoy Chookooloonks blog entry today. Just danced like a crazy woman to Talking Heads! I’m a coffee fiend… it seems to be the major part of my diet. What is Yerba Mate? ahhh I shall google it. I’ve had zero appetite for years now. I think it’s from years of taking NSAIDs, that I don’t take now. My diet is awful. Thanks for the tips! I’ve heard of kombucha and kefir, but haven’t tried either yet. The thought of eating something alive kind of unnerves me. I guess I’m used to everything being dead first… LOL! ug. hmmmm Sorry not my cup of tea. For something green and nutritious….an avocado a day keeps the Dr. away! Beautiful pics, Shreve – gorgeous greens! Discovered through in-depth research and “accidental” personal experience that 3 to 4 grams (3,000 to 4,000 mg) of Vit. C heals more soft and hard tissues than almost anything else and does it quickly and safely. Needed knee surgery badly; taking this daily mega dose of C for a different issue entirely (kidney stones) almost completely healed my knee. No surgery needed! I’ve never been so surprised – nothing short of a miracle. Hang in there, Sheila, and all the best on your journey back to feeling good again. In my last Mountain Rose catalog, I noticed the product but have never know anyone who used it. Thanks for the information. Since I absolutely trust Mountain Rose, I’ll give this a try now. As a vegetarian of 26 years, you would have thought that I would have heard of it before. I learn something new nearly every time I drop by your sites. I also take fish oil – Nordic Naturals. My doctor says that ANY fish oil capsules that make you belch are rancid and should be thrown out? Nordic Naturals comes highly recommended. 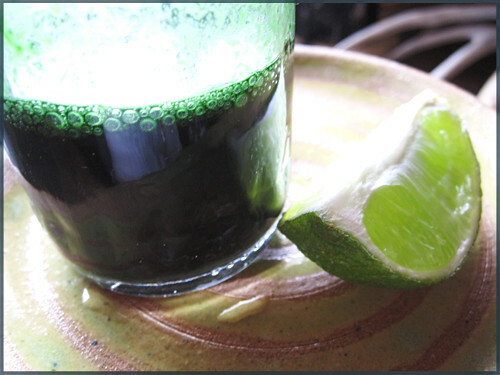 LOL – maybe if I could mix tequila with the chlorella …? My husband has wanting to go the wheat grass avenue but this looks a lot easier (just mix a powder with water! thank goodness because I seem to kill all my indoor plants.) Thanks for sharing! And because of the aforementioned fishy intolerance, I guess I’ll be taking the capsules of the chlorella. When I’m “good”, I drink a green drink called Kyo-green which is a combination of grasses, chlorella, and kelp. I mix 2tsps in a glass of pure cranberry juice(not Ocean Spray). It’s gritty and green, and you have to keep stirring it or it will settle at the bottom of glass and yuch…..you’ll have a big green surprise at the bottom of your glass…anyways, I drink that every morning and I definitely feel a difference in my energy….but when I’m “bad”…..oh boy! Off topic: your tweet about Eli eating the mouse on your pillow. Byuckptooeyack! One question – did both cat and mouse catch some air? – flax seed oil with raspberry balsamic vinegar! what brand of yerba mate do you recommend? Danielle ~ Darn it! They were my fav. Hmmm. I love yerba mate! I recently discovered it and now I’m in love with it! I’ll have to try the chlorella some day! I’m gluten..well.something too. I went off gluten before diagnosis (that’s how I found out that is what it was!) so I don’t know if its intolerance or celiac..i refuse to eat that stuff for three months. I tried chlorella and spirulina, but man oh man…2.5 hours later, give or take, I do my best Exorcist impression each time. I just can’t take the stuff. I hear its way good for you though. Have you tried water kefir? I prefer it over milk kefir personally. My grandfather gave me a box of the tablets which I’ve been taking daily. Between the chlorella and greatly reducing my wheat intake, my energy levels have increased and chronic discomfort has decreased. When they run out, I’ll have to check out the powder form. Thanks for the information (and lovely photos)! I just bought some to try, powder form, and I mixed a teaspoon with a bit of water to gulp down. EeW! Man! it looked gross, and smelled awful….I couldn’t even get myself to down it even after plugging my nose. I threw it down the sink :+( I’m going to give it another try though as I spent 20 smackaroos on it. If I can just get past the shot, I can reap the benefits! ;+) Oh yeah! Thank you for sharing this simple shot method. Until now I haven’t found a method of ingestion that worked for me. As you said it contaminates every drink or shake that you mix it with. The lime is the key here! And it’s a much cheaper alternative than going through loads of juice or milk to mask the taste.